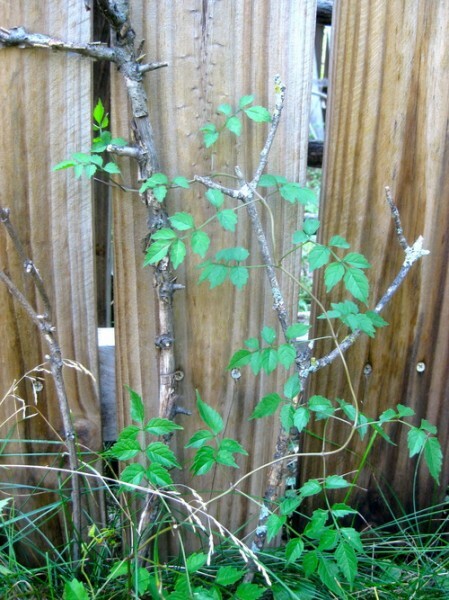 As I strive to attract more butterflies and hummingbirds to my yard, I recently purchased a perennial trumpet vine that will produce orange tube flowers. I needed a trellis, but didn’t buy one right away because I wasn’t exactly sure where the vine would go in my garden (yes, it was an impulse buy… a bad thing to do when you buy plants, really). After trying a couple of spots, I settled for one. But in the meantime, I wondered if I could find an alternative to buying a trellis. After a storm, there were many branches on the ground in the neighborhood. I picked a few of different sizes that I simply stuck in the ground and against the fence where the vine is supposed to grow. I’m not sure what will happen in the long term, but so far the vine has managed to climb well, and I really like the natural look.